Kids come with so much extra stuff that it can be a challenge to keep an organized kids room in shape. But with a few tricks, and teaching your kids to pitch in, you’ll soon be on your way to a tidy and organized space that can actually stay clean! This post is sponsored by Pampers at Sam’s Club. Affiliate links are used in this post. All opinions are my own. 1. Store Things Within Their Reach – It’s tempting to tuck everything up high and out of reach. But if it’s hard for them to get out (and you know they’re going to find a way to pull everything out) then it will be even more unlikely, and nearly impossible, for them to learn to pick up after themselves and the good habit of putting things away. Keeping books on low shelves they can easily access, and put away their books, will encourage a love of reading and help the room be quick and easy to tidy up when the time comes. Toys can be stored in low baskets so they can easily be tossed in the basket when it’s clean-up time. 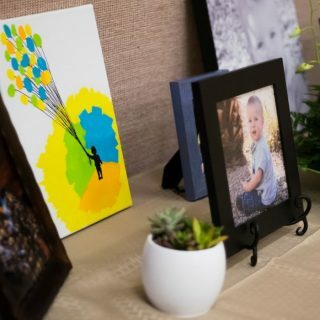 Be sure to give everything in the room a specific “place” where they belong so it’s easy to make sure things are away and your children will be able to follow the clean-up routine with ease. 2. Be Imaginative With Your Storage Space – Think about your unique space and how different storage solutions might best fit your space. For example, a dresser in the bedroom made the room feel crowded and meant my toddler was constantly changing his outfit. 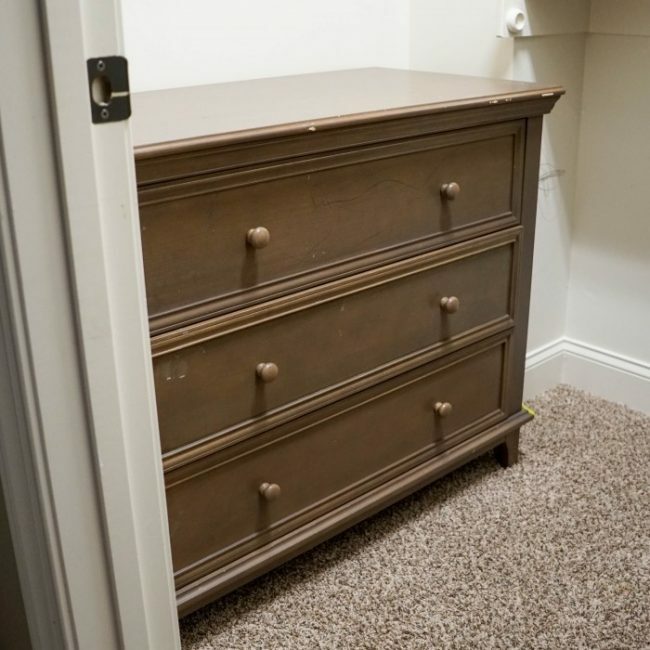 For us, the easy solution was tucking their dresser into the closet. We actually used to tuck my boys’ dresser into their sliding door closet, too, in our previous home to give us extra space. You can use under the bed storage options or build in extra shelves in the closet to give more storage options. Look at your space and determine if there’s any areas that are presenting a problem – and then brainstorm solutions. In small rooms, a small book ledge or bin can be mounted to the wall to give storage space right where the books are most often used. 3. Have a Place to Store Extras – Designate a place in your home to store extra supplies so your family is ready for anything. That can be extra space in the bedroom closet, a storage attic, under the bed, or even in the hall closet or in a spare bedroom. We start stocking up on clothes one year ahead so that the day you realize they’re pants are too short and their shirts barely fit (this always seems to happen overnight!) you’re ready with the next size up and have spread out the expense over a year of preparation. It’s also a good idea to stock up on health care items for your kids like toothbrushes, toothpaste, soaps, and lotions. 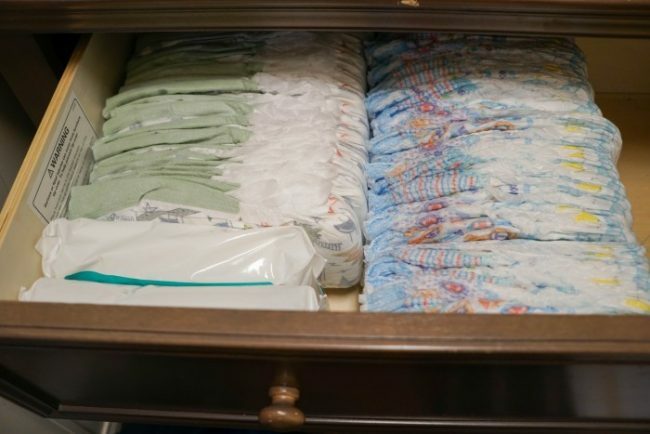 One thing we always buy in bulk is diapers! When you buy in bulk you can save a lot of money and, most importantly, not run out at the worst possible time. With little ones, be cautious on buying the next size up, rather than a lot of diapers in your child’s current size, as they grow so quickly. With two boys in my home still in diapers, stocking up is essential! 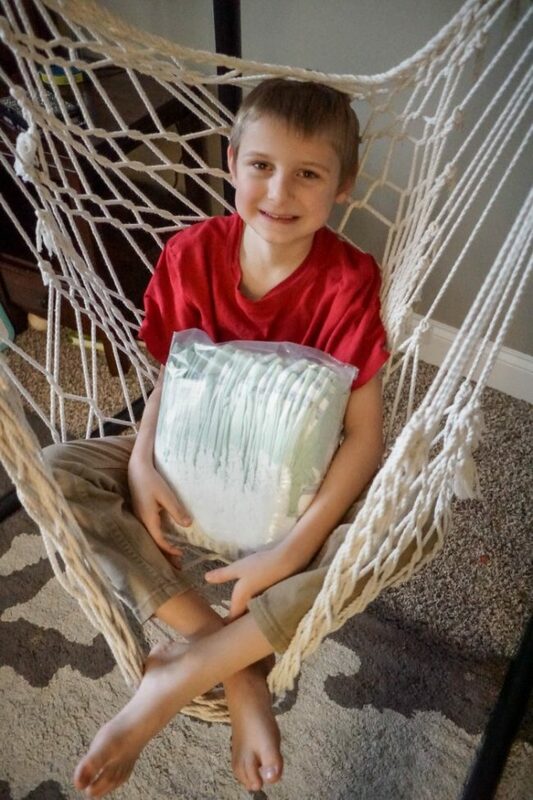 We have a 3 year old who still needs training pants and my 7 year old who faces occasional bed wetting uses nighttime diapers. 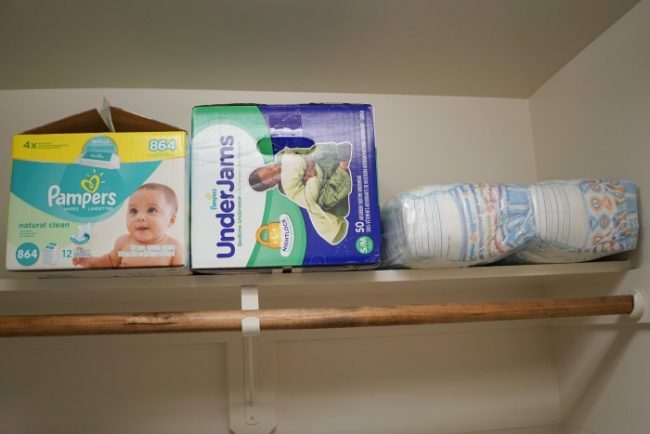 We have a specific spot at the top of their closet to stash the extra Pampers diapers and wipes so we’re never unexpectedly out. Buying in bulk lets us to stock up whenever there’s a great promotion that helps us save even more! 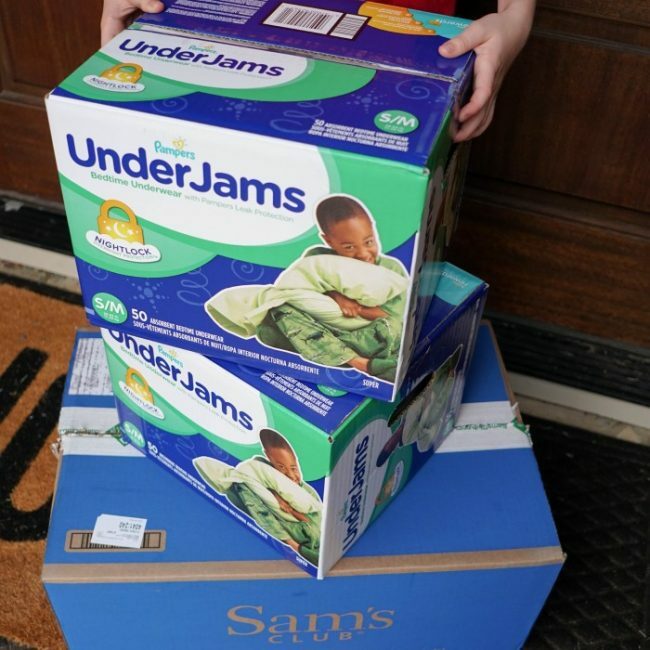 We just restocked our supply of nighttime diapers with the deal at Sam’s Club! For a limited time, you can save $10 off the purchase of any 2 Pampers products – including diapers, training pants, nighttime diapers, and wipes! Plus, you can order the diapers online with free shipping! I ordered on a Monday night and they arrived early Thursday morning! No lugging the big boxes through the store and taking up valuable cart space. 4. Donate Often – Kids seem to find a way to “collect” extras like small toys and papers and clothes they grow out of. Make it a practice to donate whatever your family is no longer using often. Keep a designated box in your garage or in the bottom of the closet to collect those items and as a good reminder to the whole family to donate often. Let the kids get involved by helping you pick 2 toys to keep out of every 3 they own every couple of months, to clear out some of the broken, old, no longer played with, or outgrown toys. 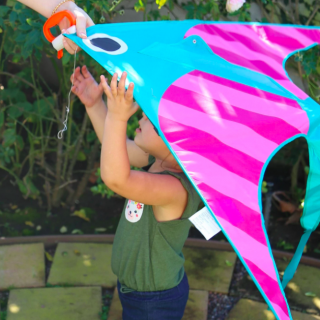 This is also a great way to reignite in your child an interest in those toys they no longer use. 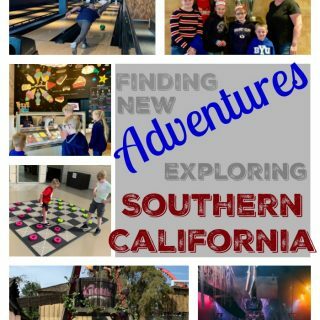 Just mention it’s time to send them on to another family and you’ll quickly see a renewed interest extending the use and life of the toys and helping you decided if it’s the right time for them to be donated. 5. Teach Kids to Help Clean – Make cleaning a frequent task that everyone in the family gets involved with. My older boys are responsible for cleaning their room every day, which makes it fast and easy to finish the task. With younger kids you can set aside an hour once a week that everyone cleans – make a party out of it! Young children will need help understanding the steps to clean a room and how they can get involved and help. Simply stating to “clean your room” can feel overwhelming. Breaking it down into simple steps can make the process faster and easier – helping everyone to do their job. 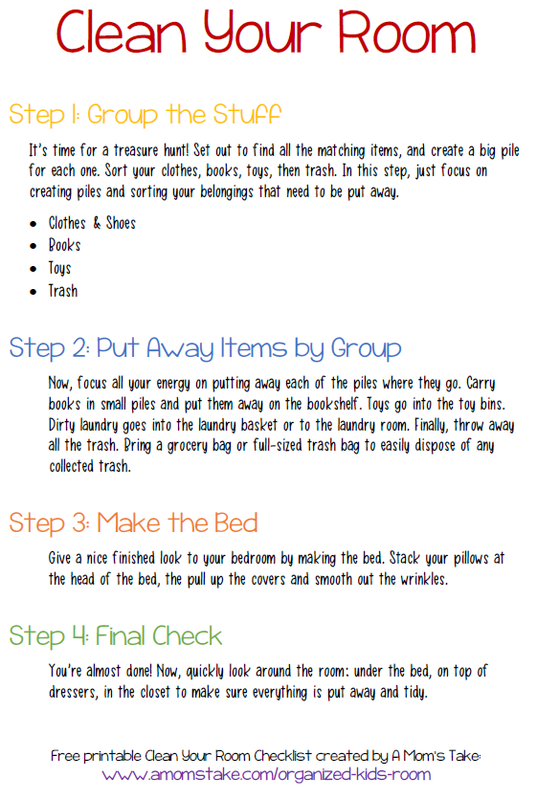 We make organized kids rooms easy by giving them this simple 4 step checklist! You can print a copy of the checklist and keep it in their room so they can simple work through the steps! 6. Keep Extra Necessities Outside Their Room – While most things can, and should, go in your kids bedroom it’s helpful to keep a few necessities within easy reach. 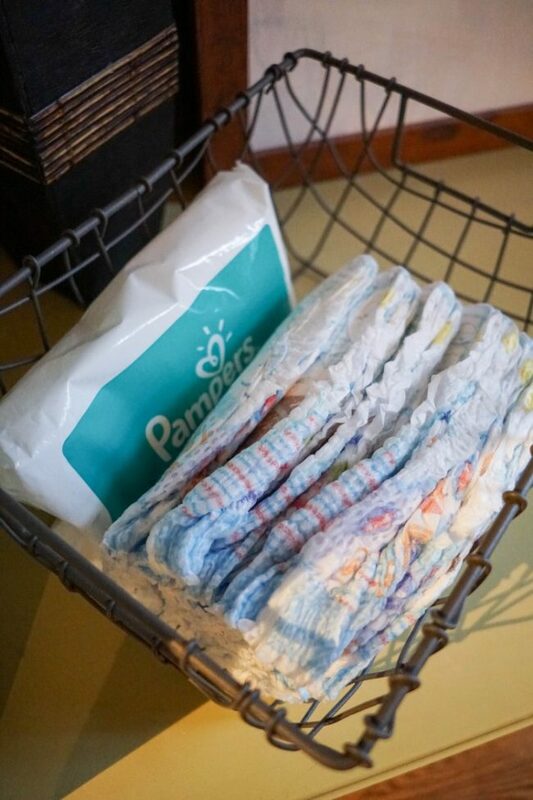 We always keep a basket of Pampers diapers and wipes right in our family room so they are a cinch to access. This helps keep my toddlers room tidier since my toddler isn’t in his room as often throughout the day. You can do the same books, a few toys, maybe even pajamas all stored in a public location where they’re most likely to be used. If you spend the majority of the day in the family room, having the things most often used there will eliminate having to bring things in and out of the room, causing unnecessary messes in their bedroom. Take advantage of the limited time special offer on Pampers and stock up, while you can! You’ll be setting up your family for an organized, and prepared new year forward by having all the essentials on hand – and saving money! 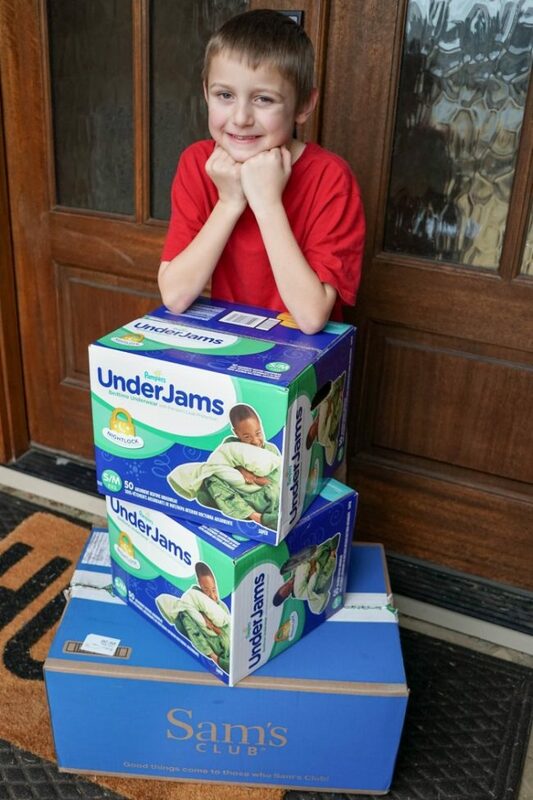 Diapers are the one things you really can’t go without – while your family still needs them, be sure to keep a good supply on hand! Save $10 off when you purchase any 2 Pampers products at Sam’s Club in stores or online at SamsClub.com. This special offer ends January 28th, 2018, so head over to stock up today! 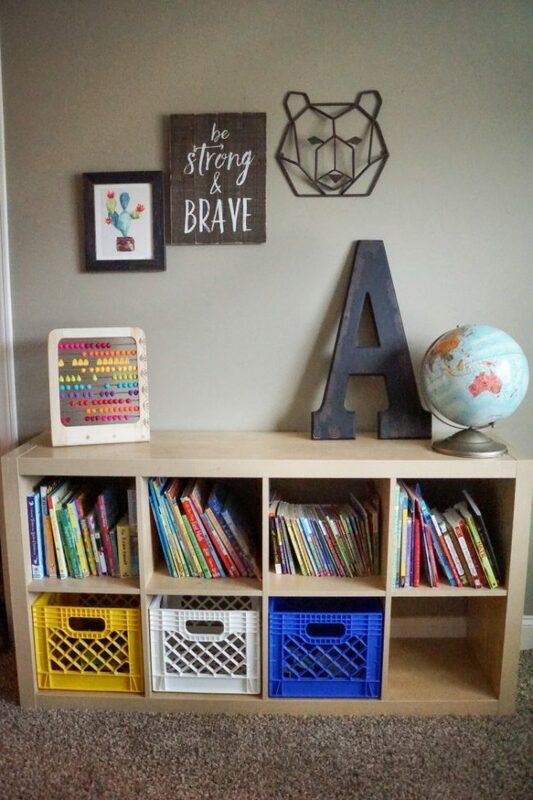 What are your tricks for an organized kids room? Previous Post: « 6 New Year’s Resolutions You Can (Actually) Achieve! 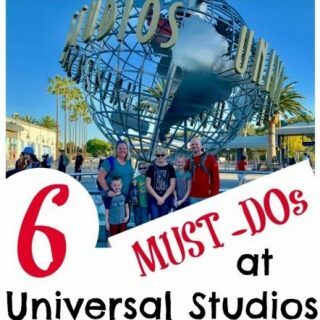 I am totally going to have to use some of these tips, they are great! It can be so hard to keep the kids rooms clean and organized. These are really quite fabulous tips that’s for sure. I am going to have to use some of these because I always find it hard to keep things organized like this. My kids room is the epitomy of messy. I can never seem to get it organized! Thank you for your tips! I could have used these tips when my girls were young. Breaking down the steps to cleaning their rooms is a great idea. I love a good organized kid’s room. 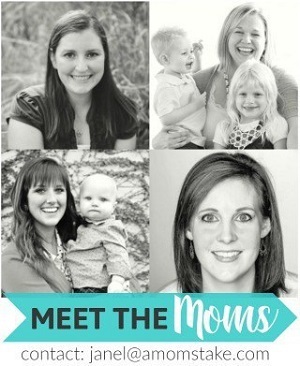 My kids love to make a mess and keep their rooms messy as heck until I clean them. My kids room looks like that…. For about five minutes LOL. I think I need to take on a couple of these organizational ideas and try them. I love these tips. You absolutely have to teach your kids to help you with keeping the house clean. It saves your sanity, and it teaches them to give back and work hard. Keeping it tidy is the hardest part!! I am totally trying your tips!! I have two kids and they keep on creating mess every where in the house. These tips are really good.